The Cybex VR3 Series Row’s dependent motion offers the feeling of security to both new and experienced users. By having both arms working together in a fixed plane, the exercise feels better controlled with more comfortable and secure training movement. The VR3 Row offers a diverging path of motion that allows the arms to follow the natural rowing motion that clears the torso. The wider range of movement engages more muscles offering better exercise results. The VR3 Row also provides the descending path of motion with optimised diverging pattern for the arms while keeping the near-neutral wrist position. 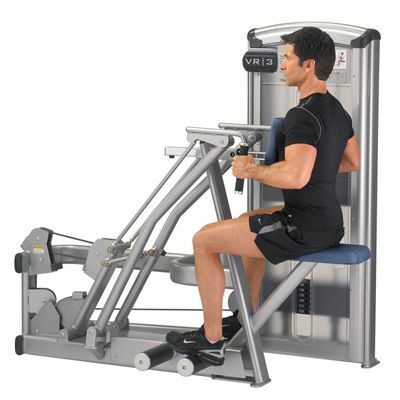 The unequal length four-bar linkage provides a near linear path of motion for consistent loading at the shoulder, whereas dual foot bars promote torso stabilization consistent with proper lifting technique. Additionally, the VR3 foot bars mean that unwanted pressure on the chest can be avoided (particularly important for women). The VR3 has been designed to withstand the toughest workout routines and is suitable for highly supervised gyms as well as self-service facilities. for submitting product review about Cybex VR3 Series Row.